It was just like they said it would be traveling to the coast. We exited a 3.5 mile tunnel under the mountains to brilliant skies, blinding sun and a 10 degree boost in temperature. First, I dug out my sunglasses, and then I peeled off my jacket! 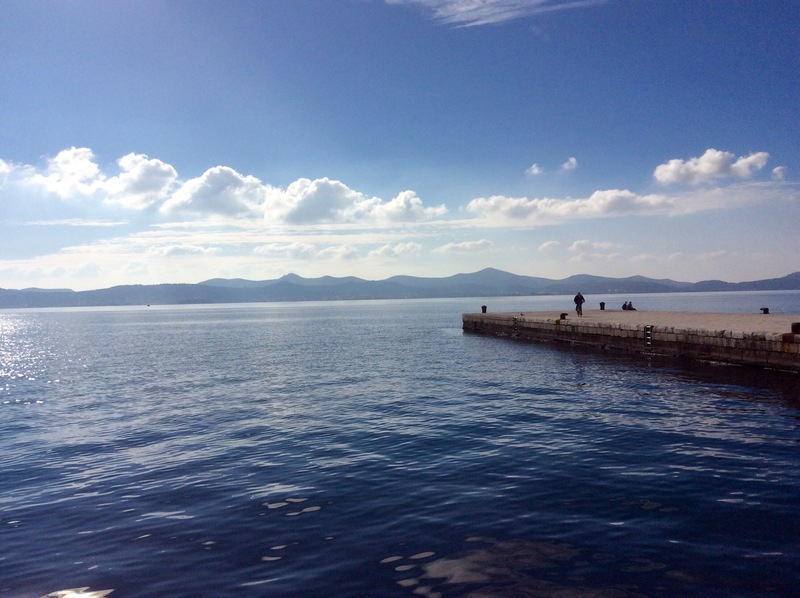 I was captivated by Zadar. 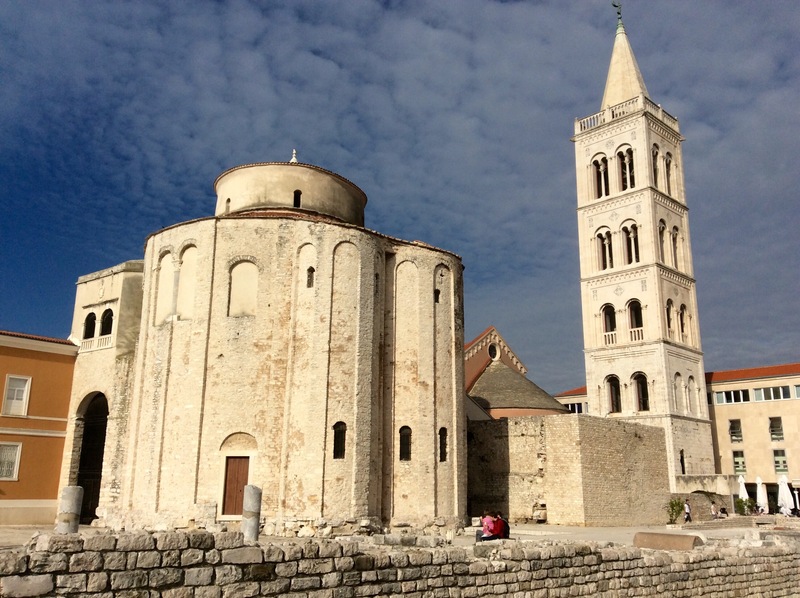 This walled city, built on a peninsula, has the remains of a Roman-era forum, Venetian gates, and old churches. 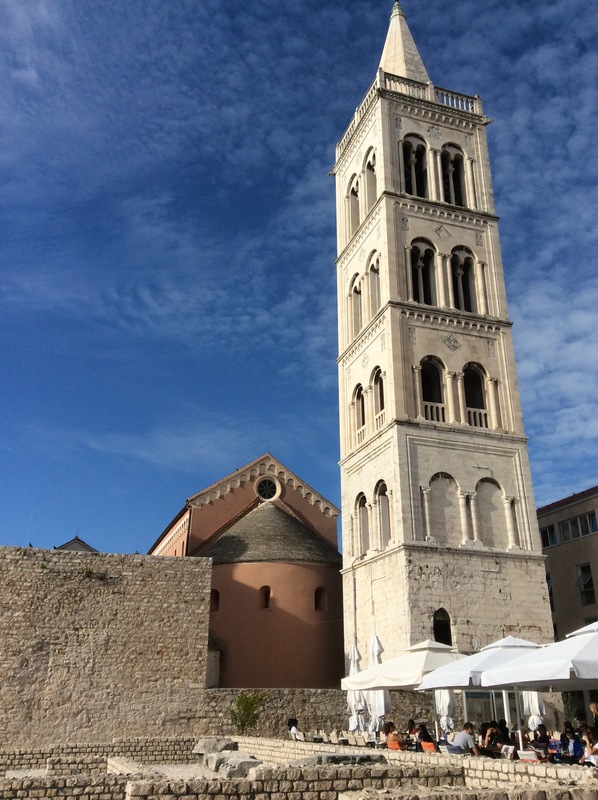 We parked the car and explored the tiny pedestrian-only historical city on foot. So many shades of blue. A deep harmonious sound reverberated from the malecon. It was so mellow and calming. The sound is generated from water movement under the sea wall forcing air upward through pipes and making mellow sounds similar to the sounds of wind chimes. They call it the Sea Organ. Another unique installation on the malecon is the Greeting to the Sun, a large circular solar panel that comes to colorful life after dark and which, unfortunately, I didn’t witness. 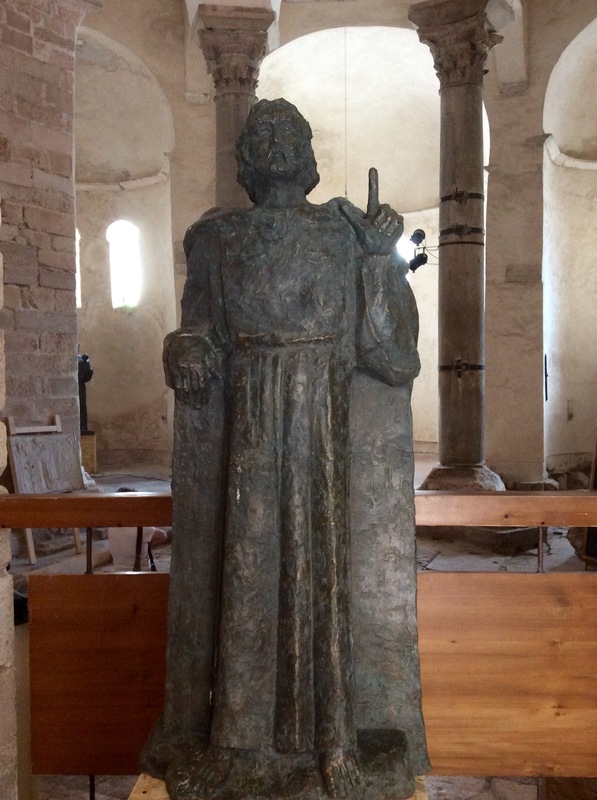 The 9th-century Church of St. Donatus, originally dedicated to the Holy Trinity, was renamed after the bishop who commisioned its construction. I was fascinated with The Church of St. Donatus which was constructed on top of odds and ends of recycled materials of an ancient forum. 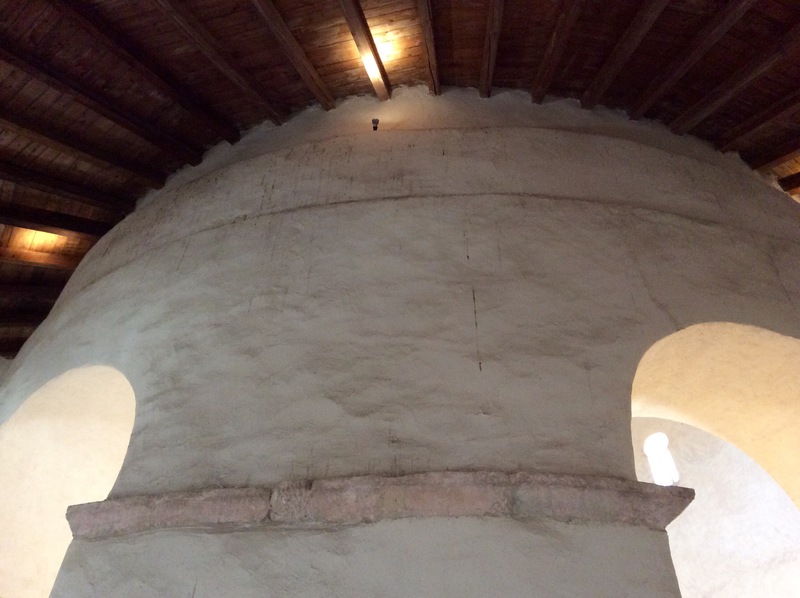 The church is quite old and unusually shaped. Only the central cylindrical core remains from its original form. 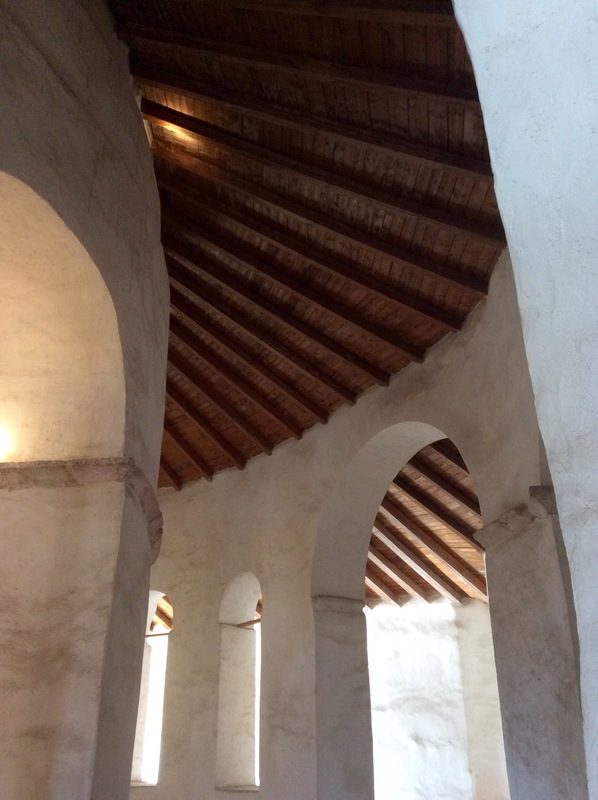 The exposed foundations reveal the “recycled” pillars and beams from ancient monuments. Many contemporary sacred art pieces are displayed in the church which is no longer used for worship. 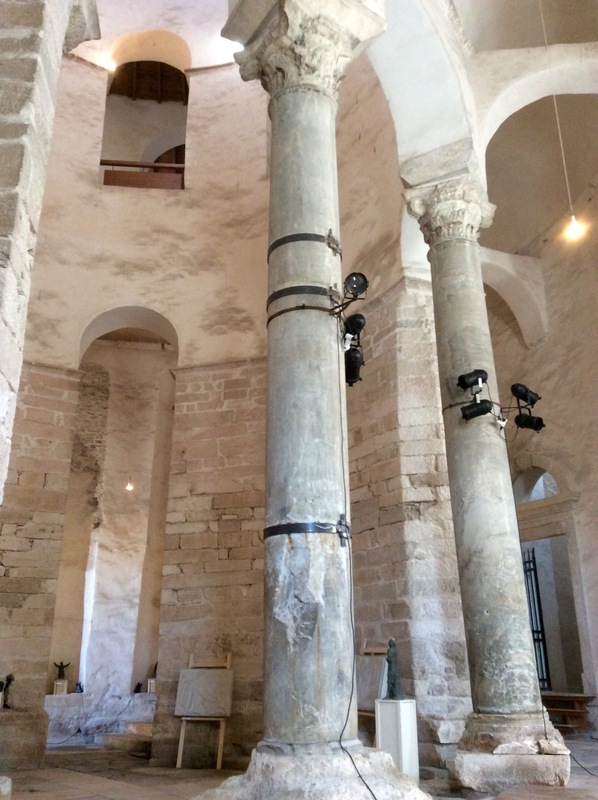 The two tall pillars in the front of the sanctuary divide the central area from the nave. The exposed foundations reveal the recycled materials. 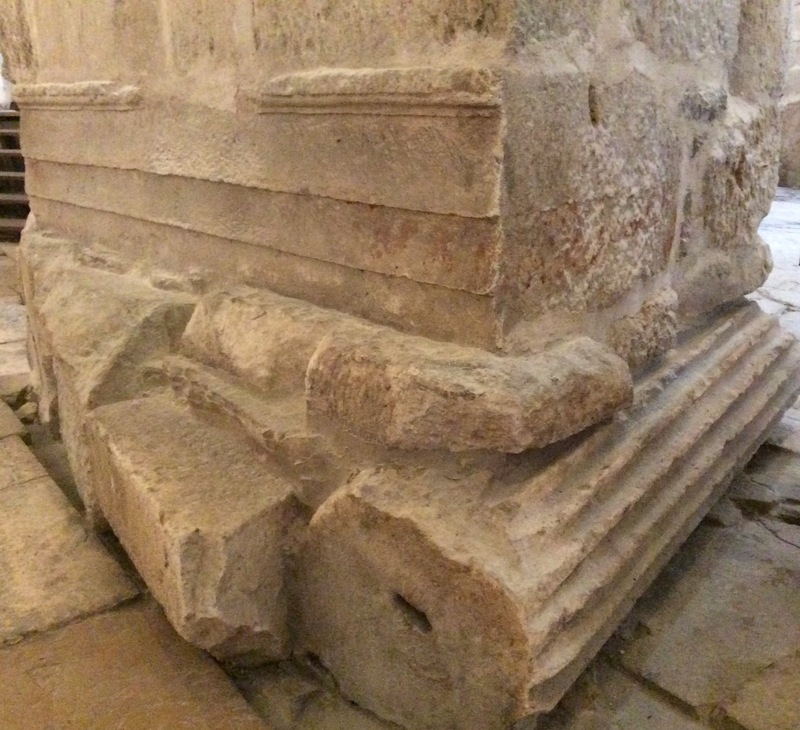 A recycled sacrificial altar to Juno with Latin inscriptions has been placed upside-down in the foundation. 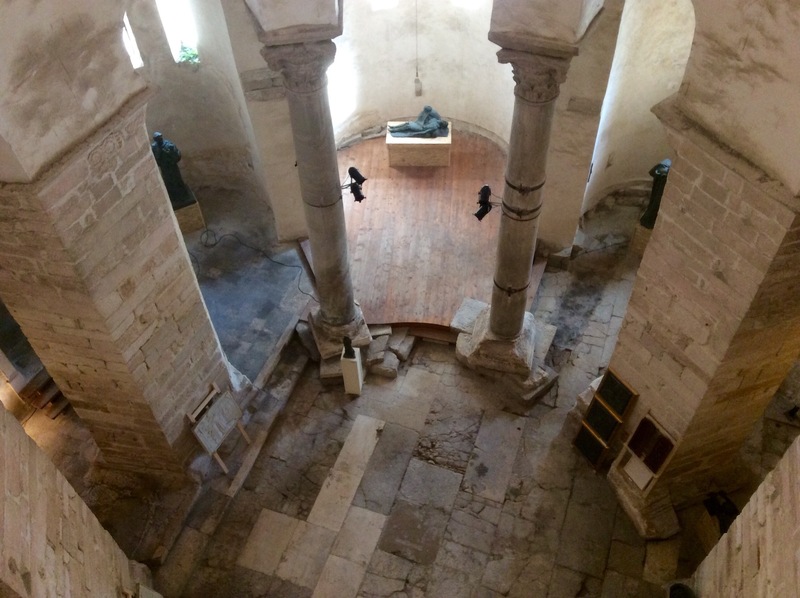 Looking down to the main sanctuary from the second-floor gallery. Looking up to the round ceiling of the central core. The round second-story wall of the central core. 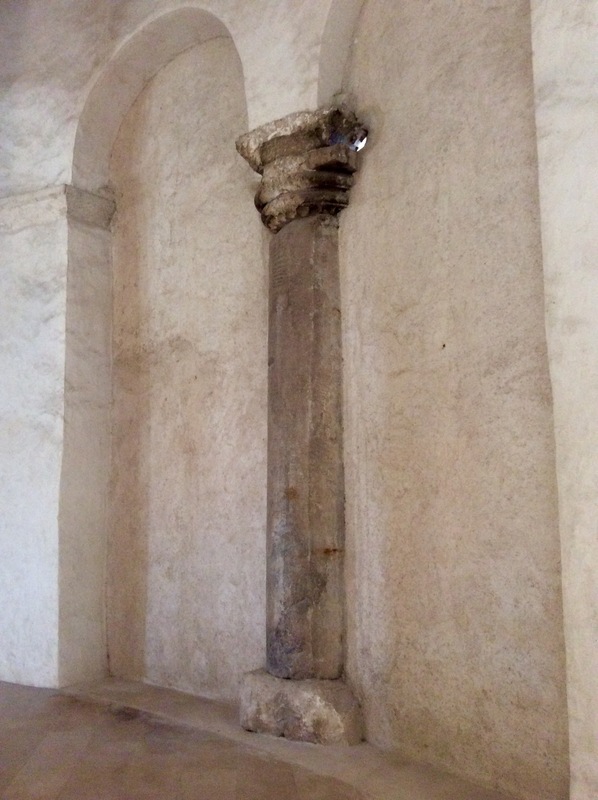 An ancient pillar in what used to be an arched opening to the now missing annex. 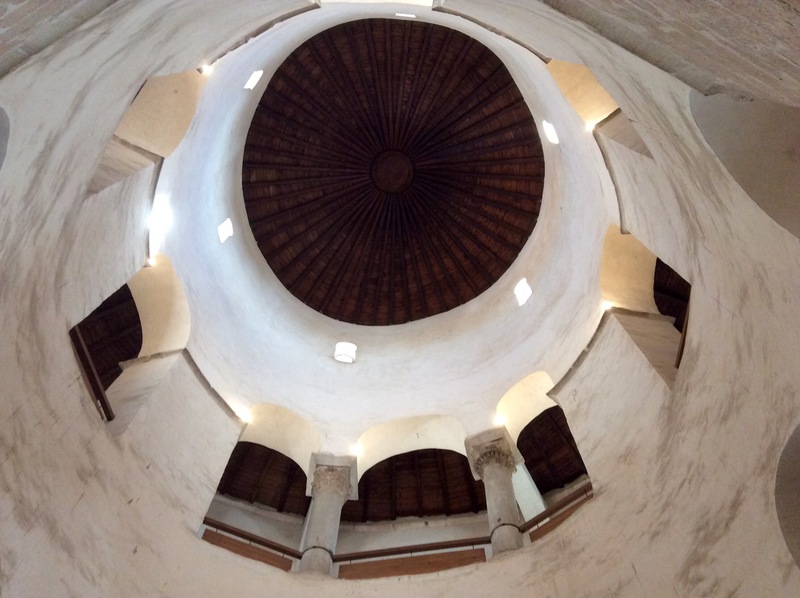 I was enamored by the beauty of this ancient circular and cylindrical structure. 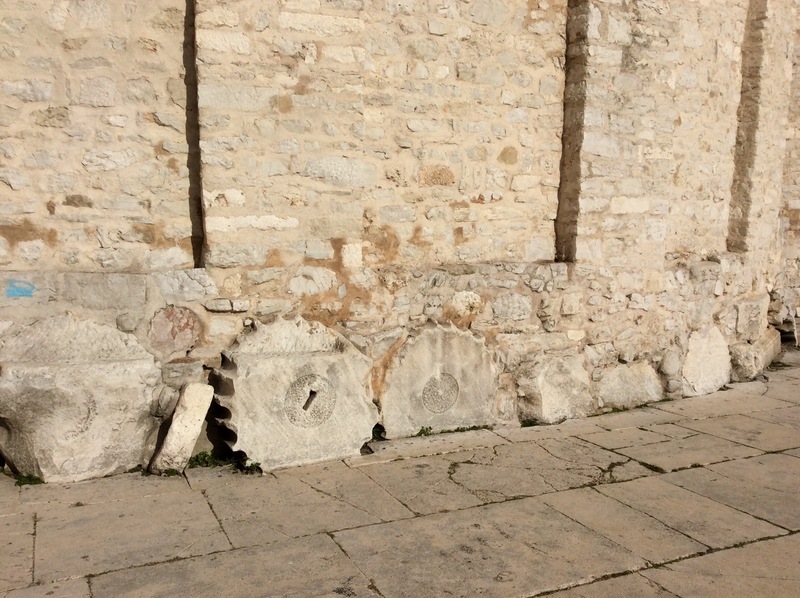 The exposed exterior foundations reveal “scavenged” doric columns and other architectural elements over which it was constructed. 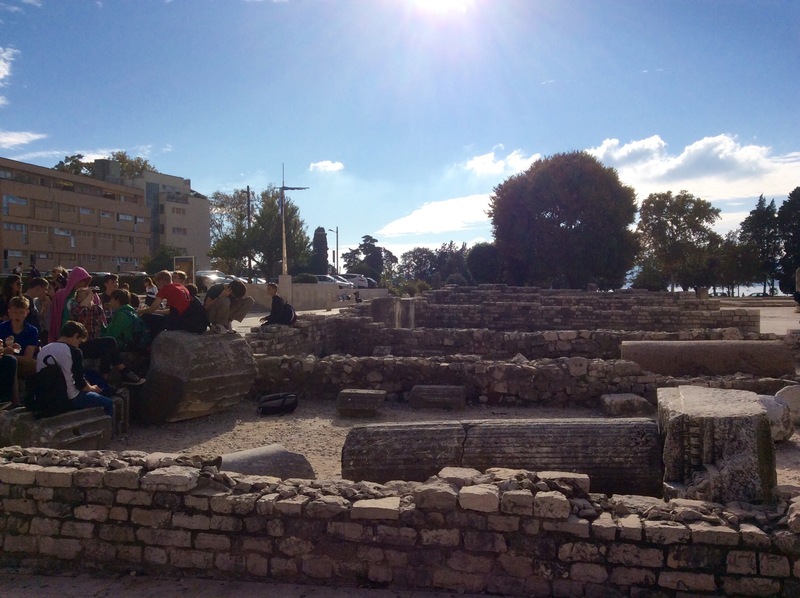 Archeological finds of an ancient forum. 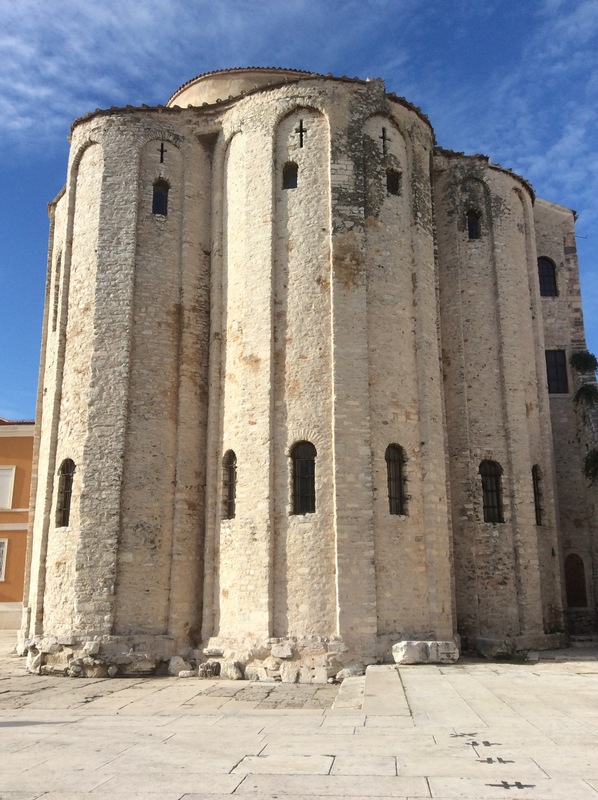 The St. Anastasia Bell Tower. Link to Sea Organ video. Link to the Greeting to the Sun video. Our welcome view upon first arriving in Split, our home away from home for the next month. 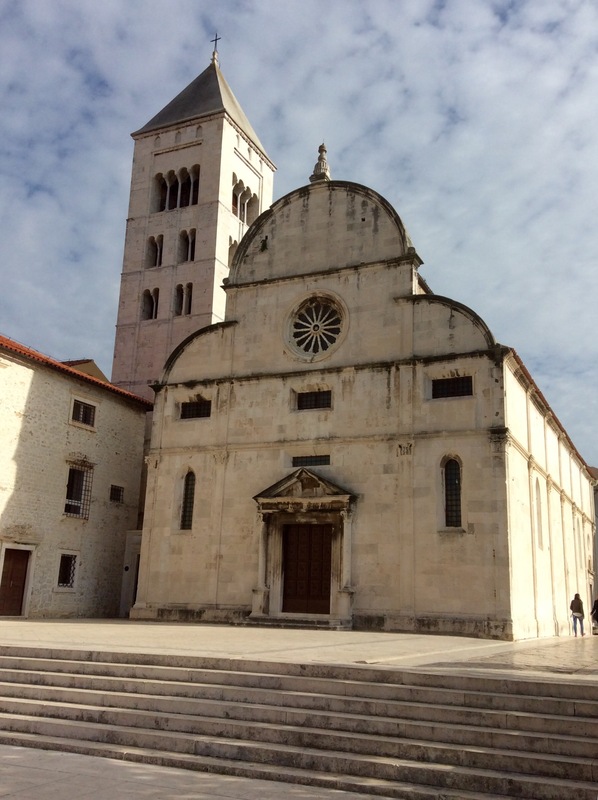 Is Zadar on your radar? Friends, we are doing great, and are happy and healthy in our Split apartment. We usually go out exploring every other day and I love letting the city slowly reveal itself to us. It’s a great walking city! The sun hits our balacony a little after 12:00 noon and I like to sit out there until it drops behind Marjan Hill around 4:00 pm and wait for the brilliant sunset show. Coffee bars are abundant and are popular for friends meeting for a drink, but not eating. Many of them are set up outdoors under awnings or with canvas walls. Some are glassed in with sliding panels to let in the fresh air. We like to find open ones in the sun especially to stay away from the cigarette smoke filled interiors. Fast food stands are very common as well. We found this fantastic coffee bar near our apartment. It has ambiance! Big news on the coffee front. Our apartment has a Nescafé Dolce Gusto machine by Krups and we are each drinking our coffee at home, usually 3-4 coffees a day. The pods cost about .35 each plus the milk, so we can drink 3 coffees at home for the price one at a coffee bar where they cost between 7-12 kuna ($1 – $1.80.) We have to walk a good long distance to buy the coffee pods since they aren’t sold in our little neighborhood groceries. Food is always a big part of our day. We are constantly amazed at the many markets and bakeries we encounter; there are 3 of each on our block! As we encounter a new bakery, we slowly walk past, craning our necks to see if there’s anything new or interesting to tempt us. The Burek (pictured below) is one of those new finds I’m crazy about (and it’s not sweet, nor chocolatey.) Burek are stuffed with meat, cheese, or spinach. My favorite is the cheese. Baked in a round dish and cut into quarters, you want to get them when they are fresh and warm. It is wrapped in paper and you carry it out and hurriedly look for a place to sit and eat. Burek are a savory pastry. Although they are flaky, the inside dough is chewy and the cheese is tangy and sometimes the cheese has cooked into the crust creating a crunchy edge. We stopped at this little restaurant alongside a marina on the malecon. I asked the waiter if he could translate and as I pointed to each one he would say, “It’s meat.” I tried the first (a mixed meat patty in sauce) and Steve ordered a pizza. Pizza with sour cream! When we needed a taste of home, the McDonalds fries were perfect! 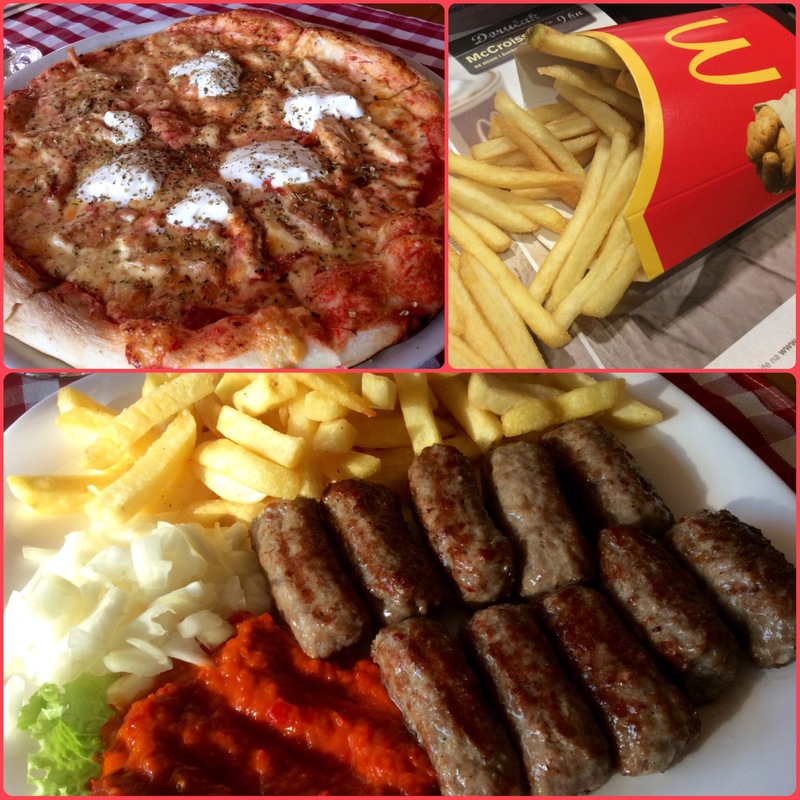 Cevapcici, a typical Croatian dish (lower photo) are spicy sausages of minced beef, lamb or pork served with the side dish of paprika, red peppers and eggplant. 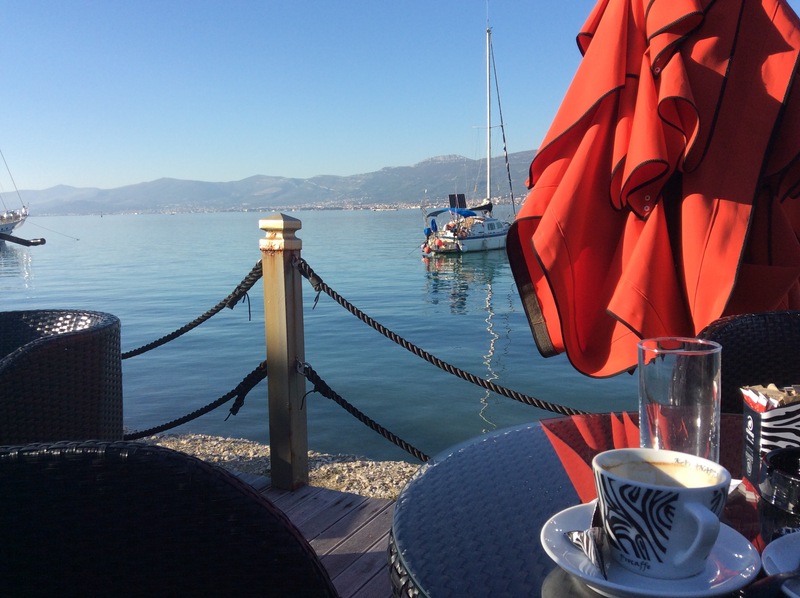 Next week we’ll Meet You in the Morning with more images from gorgeous Croatia. 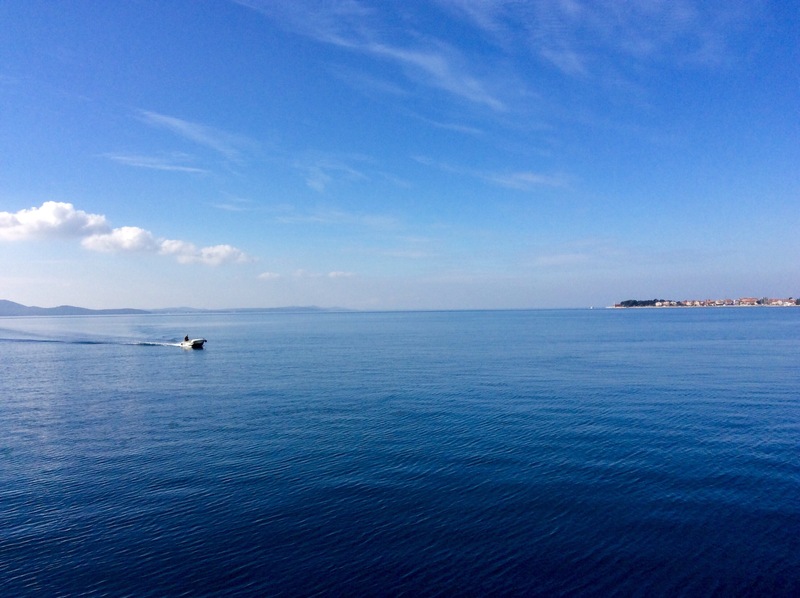 I fell in love with the Sea Organ too – we ended up staying in Zadar for 4 weeks and are now in Split to end our European adventure! …Great post! Where next for you? Hey! 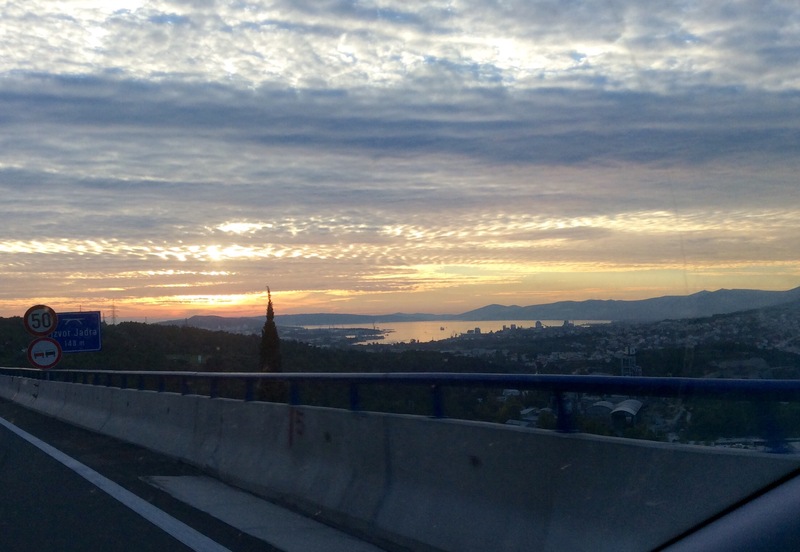 We’re in Split presently until the 26th. Then we have a week to get to our next month- long stay in Lecce, Italy. 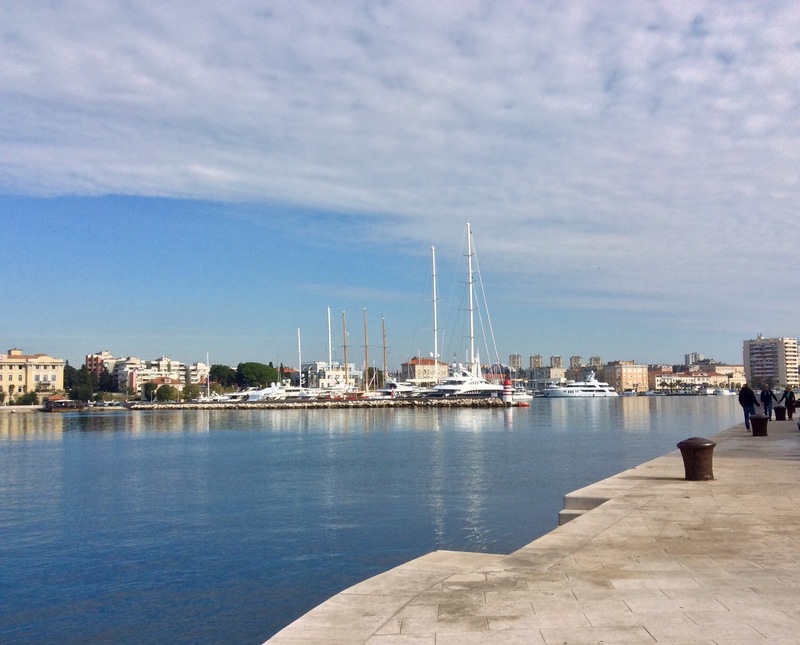 We’re looking at traveling to Mostar and Kotor and taking the ferry to Bari from Durres, Albania. What about you? Sounds like a plan!! I’ve heard Mostar is beautiful. We actually fly to Costa Rica on Tuesday so you’ll have to give me some tips as just read you were an exchange student there?! 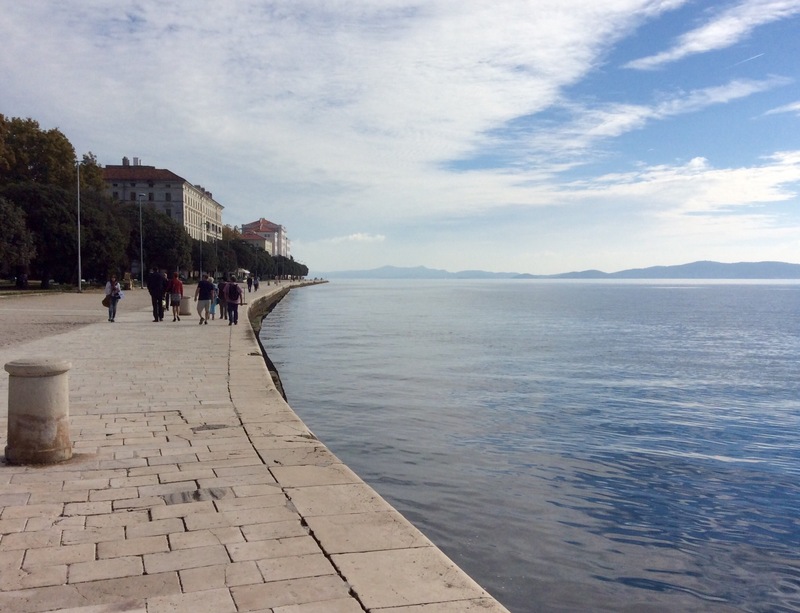 I fell in love with the Sea Organ too – we ended up staying in Zadar for 4 weeks! 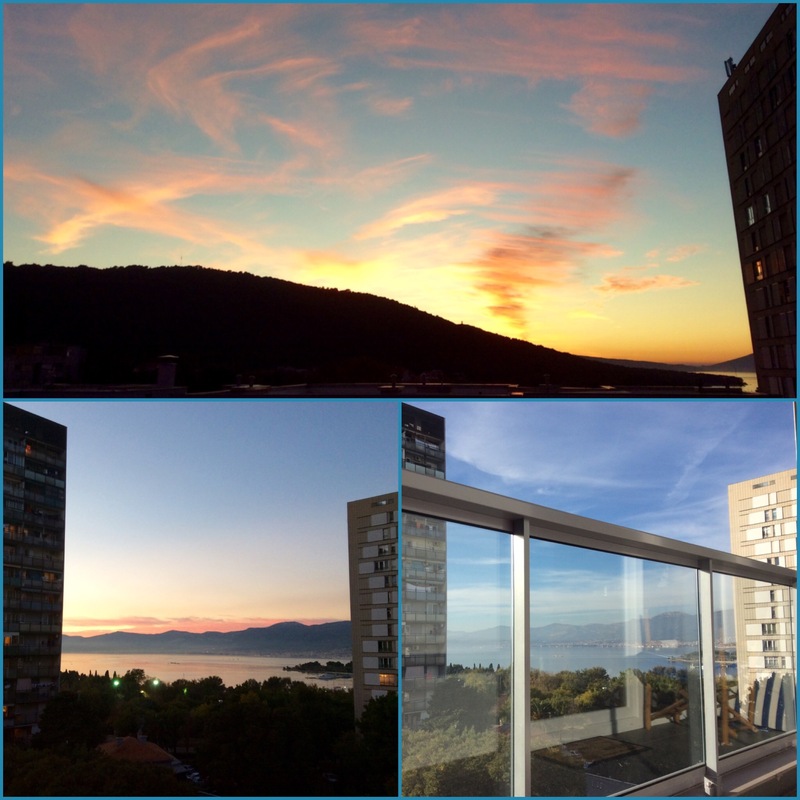 Now in Split to finish our European adventure!…great post! Where you off to next? When do you leave? Any chance we can meet before you leave? I haven’t been back to CR since 1979. But, I’m wanting to return to Central and South America.